The following pictures will give you a better idea of the process of manufacturing isolation bearings. 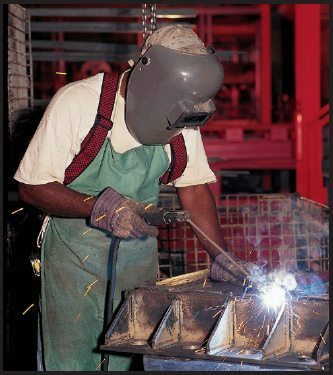 1) Our certified welder is welding the steel mold shown in photograph 2. The steel components have already been saw or flame cut in other areas of the shop. 2) Completed mold for a 4” (100mm) bearing pad 18” x 24” (457 x 610mm). The mold has a base plate with 4 heavy keyed sides. The holes in the sides are for air escape and rubber flow as the uncured rubber is compressed. 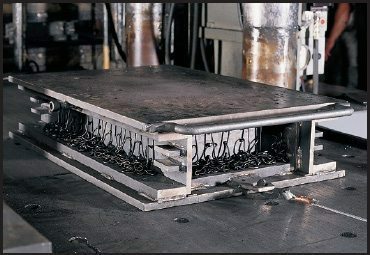 The closure plate is suspended temporarily. 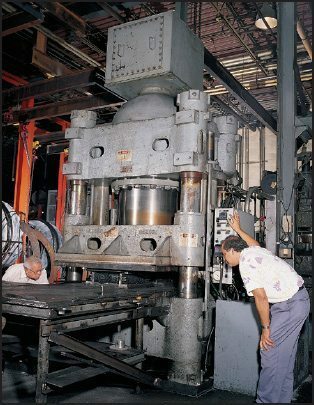 The mold is on a feed table to a huge rubber press with a 30” (762mm) cylinder and oil pressure of 3000psi (20,640 kPa). The closing force is over 2,000,000 lb. (909,090 kg.). 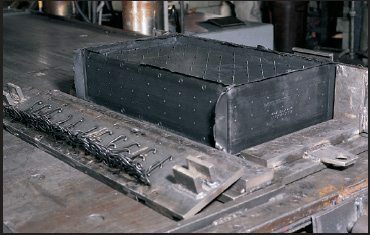 3) The uncured rubber is in layers separated by the bonded steel plates that maintain the shape factor. 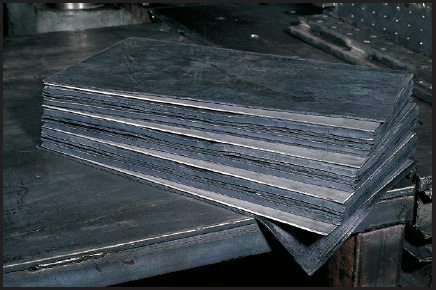 Starting from the bottom, the lower rubber cover, steel plate, and the active load bearing layer. The bearing consists of four plates, three load bearing layers and the top and bottom cover. 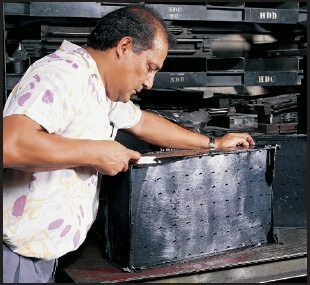 4) Our skilled pressman is placing the uncured rubber and sand-blasted steel plates, covered with a bonding agent in the mold. Two sides were removed to facilitate loading. 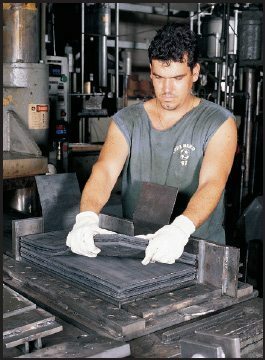 5) The mold is in the press during the slow, forceful closing. 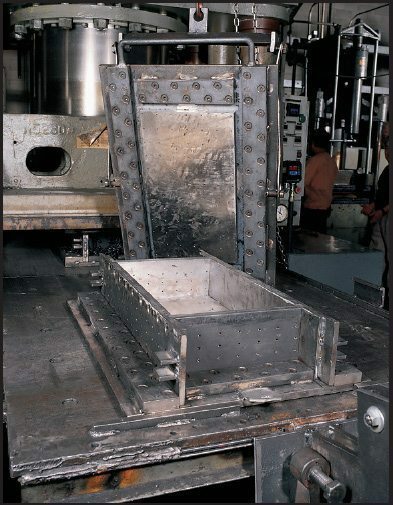 The mold will remain in the press for 3 hours at 305°F (152 °C). 6) The molding process is complete, and the mold back on the table. The excess rubber has escaped through the bleed holes. 7) The top and side plates are removed to reveal the finished part. 8) Flash rubber is removed around the edges, as well as the sprues from the bleeder holes. 9) A finished lot of bearings being wheeled to the test area. 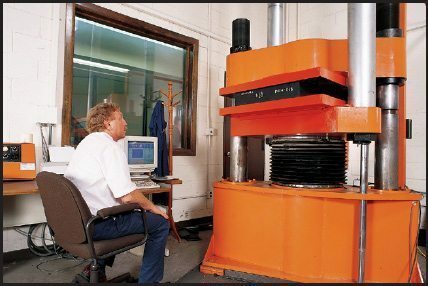 10) Computerized testing in our 750,000 lb. 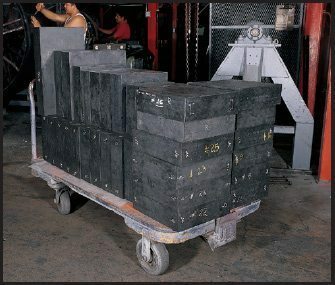 (340,000 kg.) 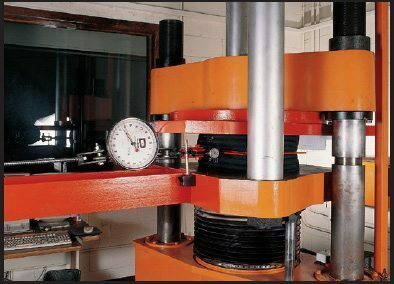 in house test machine to determine vertical spring rate and carrying capacity, supervised by our professional engineering staff. 11) Test in progress to determine shear characteristics under full vertical load. When independent testing is required, it is always witnessed by independent professional engineers. 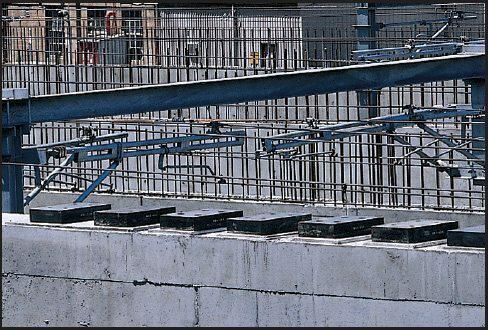 12) Photograph at Multiplex, in Melbourne, Australia showing our building support pads after placement. 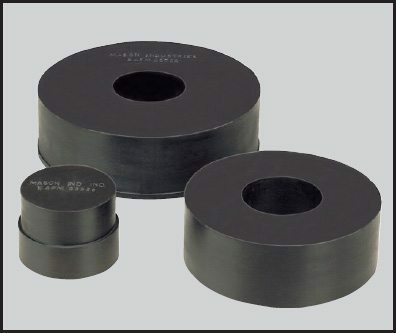 13) Simple all rubber isolation bearings used for train and underground track bed isolation as well as other applications.